Other caption slip reads: "Photographer: Jensen. Date: 05-08. 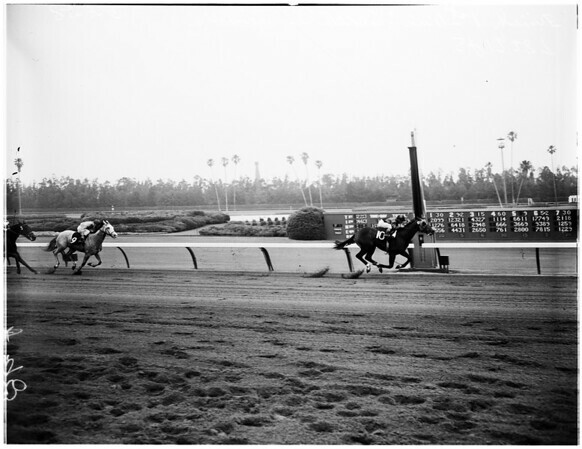 Assignment: Hollywood Park races. J43: Round Table works out at 6 furlongs, Carl Rizzo up. J42: Jan Dolan (Goose Girl) arrives on carriage to greet crowd. 92: Paddock shots. 93: Horses 1st race. 98: 1st race finish #10 wins. J102: 2nd race after start. 103: 3rd race, club house turn. J104: 4th race into stretch".